By now, most adults have fallen in love with the magical relaxation tool known as the hanging chair. We count down the seconds until we can go home and melt into the soothing embrace of our gently swinging seats. We find ways to lure our spouses out of the chair so we can commandeer it. Actually, us grown-ups may be more attached to our hanging chairs than we are to our spouses. I’m kidding! Kids have a knack for turning mundane objects into fantastical creatures, time machines, and natural wonders. In the blink of an eye, they transform your piano bench into the plank on a pirate’s ship, your microwave into a cage for beanie babies, and your poor, dismembered couch into stepping stones across a lake of lava. What better gift than a chair that hovers above the ground? Once your child realizes they have a magic carpet/dragon/sky castle/hot air balloon in their bedroom, they will be hooked. Your child will be able to exercise their imagination, and your living room couch will be able to take a much-needed break. As a bonus, your kid will probably be pretty popular with their friends, too. Why wouldn’t they, when they have a flying chair in their bedroom? The worst part about dealing with furniture in a child’s bedroom: it eats everything. Coloring book pages, homework, small animal figurines, Cheetos and assorted contraband all wind up underneath your child’s chair, and it falls on you to heft the seat up and search for the lost treasures. With a hanging chair, this risk completely disappears! Children are great at imagination and honest play, but they are often lacking in relaxation skills. The ability to consciously relax is a valuable skill– but if you’ve ever instructed your child to ‘sit down and meditate’, you know it’s a lot harder than it seems! 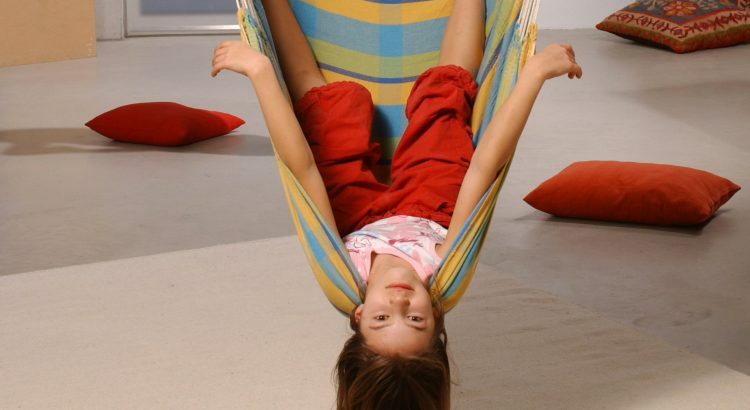 Hanging chairs are the perfect way to teach kids how to sit still, be quiet, and let their muscles relax for a few minutes. On the one hand, the gentle swinging motion will help prevent them from feeling bored or restless, as they often do when forced to sit in one spot. In addition, the swinging (or rocking) will soothe their bodies and minds, making them enjoy the process of slowing down far more than they would otherwise. It’s like a rocking chair, but prettier and more interesting. Though a hanging chair for kids will serve as an excellent magic carpet in their little kid years, it can also become a quirky, cute addition to their childhood bedroom, and later, an elegant, soothing focal point in their teenage bedroom. Unlike princess-themed sofas or superhero bean bags, your child’s hanging chair will be there to stay for years to come– even as the rest of their furniture grow and evolve around it. For most parents, the only thing more difficult than getting a child to eat steamed broccoli is getting that child to read. Fortunately, a hanging chair may be just what you need to get their nose in a book! Most hanging chairs have a very roomy seat, allowing your child to fidget, curl up, and squirm as they please. More importantly, kids can swing while they’re turning the pages, which can help them stay focused and engaged with the story for longer periods of time. You can make your child into a bookworm yet. One of the biggest causes of tears among kids– aside from tangled hair– is the dreaded Furniture Toe Stub. With a hanging chair, it’s virtually impossible for your child to stub (or even break) their toe when they’re playing soccer in their bedroom even though you told them not to.